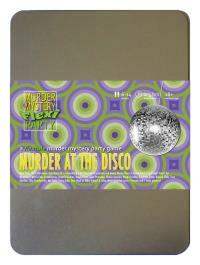 You've been invited to play the role of DON SHAFT in Murder at the Disco. New York, 1977. Hot nightclub Disco 54 is hosting a birthday and only the coolest people are there. But before anyone can 'get down on it', nightclub owner Doctor Disco is found dead in the VIP lounge! Join us to find out whodunit! You work the streets and dress for the streets in bell-bottomed jeans, thick turtleneck sweater and long leather jacket. A gun holster can just be seen hanging from your shoulder and your sideburns almost touch your moustache. Most people will say they grew up poor, but your family was so poor they used fireflies for lights (there were plenty in the cave). Your mother tried to force you into ballet but there was only one route you could see to survival - joining the NYPD. That’s been a rocky ride too - your name has inspired constant mockery. But you’ve stuck with it, and managed to rise to the heady heights of detective, a position you intend to keep. I’m Detective Shaft, and dig this, there’s a certain Italian family that wanted Disco dead. I’ve been the cool undercover cat chasing their dough balls around for the last three years and it’s all led to this. Whatever Disco did to Little Italy, he paid for it with his life! I’m gonna be doing my own investigation tonight and whichever one of you sons of B’s did it - you’re gonna get the full Shaft!